The problems of detecting and accounting for spectral and nonspectral interferences arising in the determination of a wide range of elements in biological and pharmaceutical samples by inductively coupled plasma–mass spectrometry are discussed. 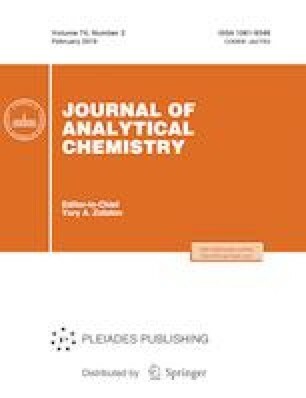 We studied the features of the effect of matrix components on the accuracy of the results of analysis of biological fluids and pharmaceuticals using a quadrupole mass spectrometer. The processes that have the most significant effect on the suppression of an analytical signal measured by an Agilent 7500c quadrupole mass spectrometer are revealed. The main operational parameters responsible for minimizing the investigated nonspectral interference are determined. Various versions of the internal standard method are studied, which offer a decrease in the effect of the sample composition on the determination results. A direct relationship is found between various modes of operation of the instrument and the criteria for selecting an internal standard. Combined approaches to the complete elimination of nonspectral interference using external calibration are proposed. A method is proposed for decreasing the acidity of the test solution by adsorption separation of the analyte elements and acid. The studies were supported in the framework of the programs of the Presidium of the Russian Academy of Sciences 2010–2015 “Creation and Improvement of Methods of Chemical Analysis and Research of the Structure of Substances and Materials” and 2015–2017 “Chemical Analysis and the Study of the Structure of Substances: Fundamental Principles and New Methods” and by the Russian Foundation for Basic Research, project nos. 12-03-00804 and 16-03-00428.